I love food. I love eating delicious and visually appealing food. That's why I'm trying to lose weight :P If you are such a gourmet, then you will love Fake Food Japan. But don't get me wrong! These are genuine fake food! This great company sent me a Crab Claw USB Flash Drive - 4GB for review ($50.35 value). I really love crab meat, so I chose it. 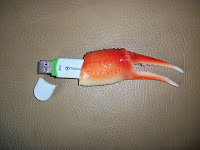 If you are a crab lover then this is the USB flash drive for you! The flash drive is working very well; you don't need to install anything to make it work. I will be able to store my files and important documents there easily. The flash drive is embedded in the crafted fake food and doesn't fall or move, so there is no risk to lose it. But what must be emphasized here is the similarity of this fake food to a real crab claw. The elaborateness is perfect. I think they handle this difficult job with easiness. The result is so good that you really want to feast! When I first saw the products on the website, I felt immediately hungry :) These would go perfectly well in the kitchen as a complementary accessory. But please keep them away from your little children as they may mistake them for real food. Established the business in May 2012 to fill the need of offering Japanese fake food to enthusiasts/collectors around the world for purchase online in English. We are the first online site of its kind and strive to promote this particular Japanese culture worldwide through our products. Even with Japan’s rich cultural history, many don’t know that “fake food” originated here and is one of the country’s best-kept cultural secrets. The Japanese fake food industry got started in 1932 in Osaka (food capital of Japan) and grew exponentially when US military servicemen came over during the war and needed visuals since they couldn't understand what was written on restaurant menus. From there, the industry has grown into a $100 million industry in Japan where it currently stands today. BUY IT: Business card cases are between $27.69 - $33.98; cell phone charms/zipper pulls are between $7.55 - $22.66; headphone jack plugs are between $7.55 - $17.62; iPhone 4 cases are between $33.98 - $47.83; ear picks are between $8.81 - $18.88; frisk mint cases are between $27.69 - $33.98; keychains are between $7.55 - $22.66; life-size replicas are between $17.62 - $832.00; magnets are between $8.81 - $23.92; USB flash drives are between $44.05 - $50.35. They ship worldwide! WIN IT: One (1) winner will receive any one item less than $55 value from Fake Food Japan. Wow those look amazingly real!! I love the magnets - perfect for the fridge! I love the Waffle Keychain! I am laughing so hard at these! They are really funny, but beautiful, too! :) I love the Candied Apple Ear Pick! I'd love the Takoyaki (Fried Octopus Ball) with Mayonnaise USB Flash Drive (4GB) ! Woops forgot to put that I like Chocolate Parfait Replica! I really like the blueberry parfait keychain. Cute! I like the chicken wing keychain. Grilled Steak Magnet. so unique and cool. I like the full size Age-dashi Tofu replica. Looks yummy, but I can't eat it! I love the Assorted Sushi for 4 Replica! I love the Shrimp Sushi Keychain! Lots of fun stuff there. I like the Strawberry Parfait Replica. My favorite is the lobster claw, but also love the Octopus Ver. 2. :-) Thank you. I like the Stir-Fried Shrimp with Chili Sauce Business Card Case. - Judith R.
I like the shrimp sushi usb drive! I like the white spring onion flash drive! 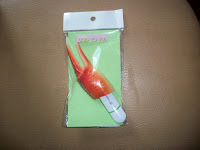 I'd love to give my brother the crab claw usb for his birthday, he'd really enjoy this! I loved the Shrimp Cell Phone Charm/Zipper Pull! So awesome! These look like so much fun! I love the Blueberry Parfait Keychain! It looks yum! the Waffle Keychain is cute! My favourite item is the 'Chicken Rice with Shrimp iPhone 4 Case', so cute! :) I love the little prawn in the middle. I'm logged into Rafflecopter as Kate Ryan. the octopus key ring for sure! I like the Cucumber Roll Sushi Cell Phone Charm/Zipper Pull. Those are adorable! I especially Love their keychains, i like the boiled egg one, but as a banana lover i just need to have "whole banana keychain" ! I like the eel sushi keychain the most, but I love most of the keychains! I love the Magnets and also the iPhone 4 Case....they're so unique!!! I love the iPhone Case...and also the magnets. So unique and fun! I especially like the life-sized replicas of strawberry ice cream and cookies 'n' cream ice cream. I like the Fried Rice iPhone case. I like the shrimp sushi USB flash drive. I like the crab claw USB driver. The business card holders look awesome. I like the waffle keychain. I love the shrimp sushi drive! I love the crab keychain"
I love the Uncured Ham iPhone 4 Case. Also, what the heck is an ear pick? I like the iPhone case that looks like meat. I love the uncured ham iphone case! I like the Crab Claw Magnet. In fact, all of the magnets are adorable! I like the Assorted Sushi for 4 Replica. I like the Blueberry Parfait (mini) Cell Phone Charm/Zipper Pull! The bacon and onion miso soup business card holder is too cute! I want that CLAW! I want that CLAW!! The crab claw flash drive is awesome! Love the crab claw flash drive!!! I would go for the steamed pork dumpling usb. I love dumplings so much I had to lay off of them, because I was over-eating them. I love the Candied Apple Ear Pick! I like the Pancake key chain. the flash drive caught my attention.